My knowledge and experience of Conan in his comicbook form has been sporadic at best, dictated primarily by time and budget over the last few years. However, when the first issue of Dark Horse’s new Conan The Slayer series fell into my lap, I simply couldn’t pass up the opportunity to take a look. And as it turns out, I’m very glad I did. This is a perfect jumping-on point for the iconic Barbarian, with little to no prior knowledge of the character required before reading. Yes, writer Cullen Bunn opts to drop us right into the thick of things as we join a badly-wounded Conan being hunted by a band of Turanian hunters following a brutal battle, but all of the blanks are filled in throughout the course of this issue, providing either a smooth transition into the character or a welcome reintroduction, depending on your previous knowledge. For such an epic fantasy setting and larger-than-life character, this is a surprisingly intimate story – for the time being at least. 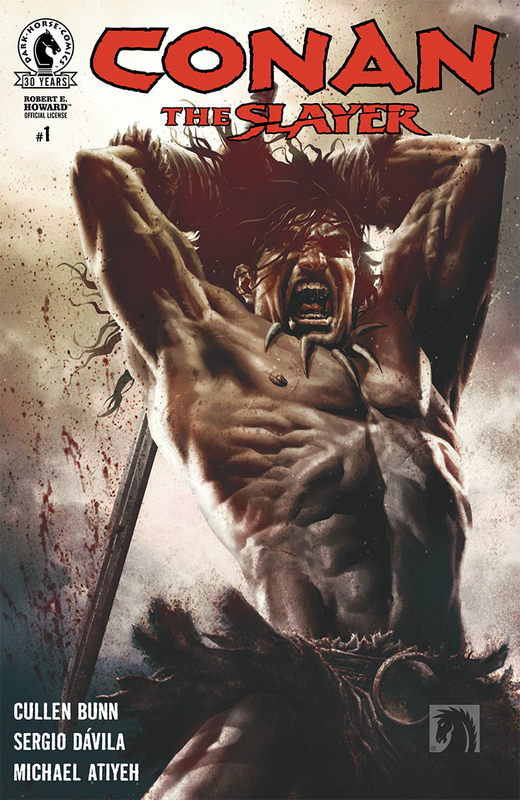 Bunn’s typically eloquent prose narrates Conan’s attempts to survive with flair and panache, adding an extra sense of emotional heft as the Cimmerian stubbornly presses on in spite of his death seeming more like an inevitability than a possibility at times. The dialogue feels authentic and flows naturally, with some particularly scathing verbal barbs being delivered by Conan himself. Bunn’s story is brought to life by the bold, dynamic pencils of Sergio Davilla, whose steadfast, defiant Conan is a thing of grim beauty. His combat is unashamedly brutal, and is presented as a dirty, animalistic affair rather than a polished bout of choreographed swordsmanship. Conan himself isn’t a character who carries much emotion on his face, but Davilla does a more than admirable job of portraying the reactions of the characters he encounters, from the wide-eyed Turanians to the confident, disdainful Kozaki bandits. Given his extensive and varied back catalogue, it’s somewhat difficult to do anything that’s truly different or unique with Conan. So, rather than overreaching and risking jumping the shark by inserting Conan into some ludicrous situation, Bunn instead opts to embrace the classic traits of the character, showcasing to scintillating effect the violence, restraint and sheer presence that has made Conan such an enduring character over the last eighty-odd years. As introductions go it’s a punchy, aggressive affair that tells you everything you need to know about the man himself. Conan’s encounter with the Kozaki plants the seeds for some interesting stories as the series progresses, and Bunn and Davilla combine to provide an emotive, visceral take on the iconic barbarian. Highly recommended.